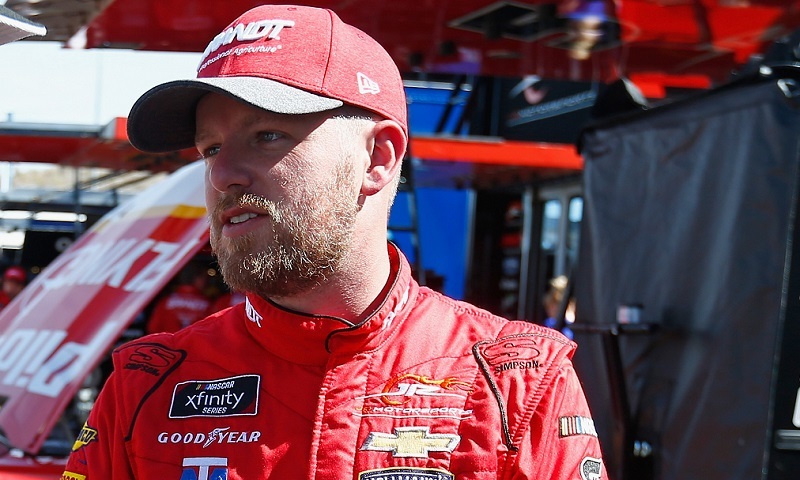 AVONDALE, Ariz. – Justin Allgaier will start Saturday afternoon’s NASCAR Xfinity Series race at Arizona’s ISM Raceway from the same place he ended in one year ago: the first position on the pylon. Allgaier, the defending winner of the DC Solar 200, raced to his sixth-career series pole and first of the season with a huge lap of 26.896 seconds (133.849 mph) in the third and final round of qualifying. The Riverton, Illinois native is seeking his first win of the year in the No. 7 BRANDT Chevrolet Camaro. Allgaier will be flanked on the front row by Monster Energy NASCAR Cup Series regular Brad Keselowski, who qualified second with a lap of 26.909 seconds (133.784 mph) in the No. 22 Fitzgerald Glider Kits Ford Mustang for Team Penske. Keselowski’s teammate Ryan Blaney finished second in both races last season at the one-mile oval. Cole Custer was third for Stewart-Haas Racing in another Ford, followed by the Joe Gibbs Racing Toyotas of Christopher Bell and all-time Xfinity wins leader Kyle Busch. Jamie McMurray, Ryan Truex, Daniel Hemric, Matt Tifft, Brandon Jones, Ryan Reed and Spencer Gallagher filled out the first six rows of the grid and all made the third round of qualifying. Austin Cindric was the first driver who failed to advance to the final knockout round, posting a lap of 27.350 seconds (131.627 mph) and timing in 13th with the No. 60 Pirtek Ford Mustang. Cindric also narrowly missed having a chance to run for the pole one week earlier at Las Vegas Motor Speedway. Other notables who will start deep in the field include Ty Dillon (14th), Michael Annett (15th), Kaz Grala (17th), Ross Chastain (18th), Jeremy Clements (21st) and Elliott Sadler (24th), who did not take a lap in round two knowing he will start from the rear of the field in Saturday afternoon’s race. Sadler’s JR Motorsports teammate Tyler Reddick took a hard hit into the outside wall in turn three on his first round run, sustaining heavy damage to the right side of the No. 9 Nationwide Children’s Hospital Chevrolet before he could complete a full lap. Reddick will start from last on the grid, rolling off 40th in a backup car that was rolled off the trailer before the conclusion of qualifying. The DC Solar 200 takes the green flag at 4 p.m. ET, live on FOX, the Motor Racing Network and SiriusXM NASCAR Radio, channel 90.